Utagawa Kunisada/Toyokuni III (1786-1865) Woman with Cat, 1830. Kakemono-e (vertical double oban). This is a very delightful and beautifully fresh kakemono-e of a woman in fashionable dress holding a child in her arms whilst a cat plays at her feet. 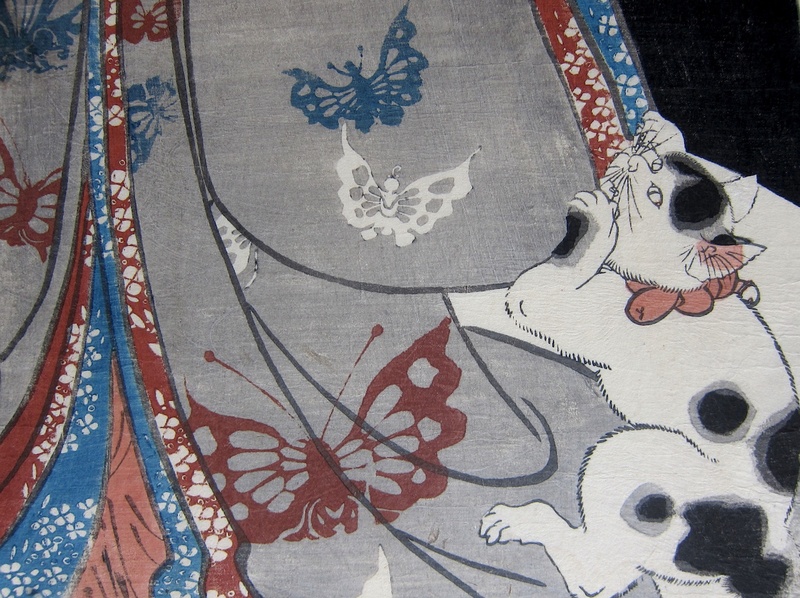 A lovely observation and visual pun is implied in the gesture of the cat which is lunging at the butterflies embroidered on the kimono of the young woman. This is a fine and intimate piece. Kunisada uses great skill and delicacy to render the gentleness of the woman’s gesture and the subtle palette of greys, blues and browns. The print is quite early - around 1830 - and the impression, detail and colour are all very fine. There is some discolouration to the blank paper of the upper sheet but this does not interfere with the image. The sheets are full size.